Katrina Firlik is currently chief medical officer and co-founder of HealthPrize Technologies, an Internet company with a novel approach to medication non-adherence, one of the most significant problems in healthcare. Before founding HealthPrize, Katrina was a neurosurgeon in private practice at Greenwich Hospital in Greenwich, Connecticut, and on the clinical faculty at Yale University School of Medicine. In addition to her scientific publications, Katrina is the author of Another Day in the Frontal Lobe: A Brain Surgeon Exposes Life on the Inside, published by Random House and reviewed by The New York Times, The Los Angeles Times, and O Magazine. She enjoys conveying medical concepts to the public and has appeared on CNN, Fox, and MSNBC as a commentator on a variety of medical issues. She is also co-inventor of a brain stimulation device designed to enhance recovery after stroke. Katrina grew up in Shaker Heights, Ohio. She attended Cornell University, with a major in cultural anthropology. 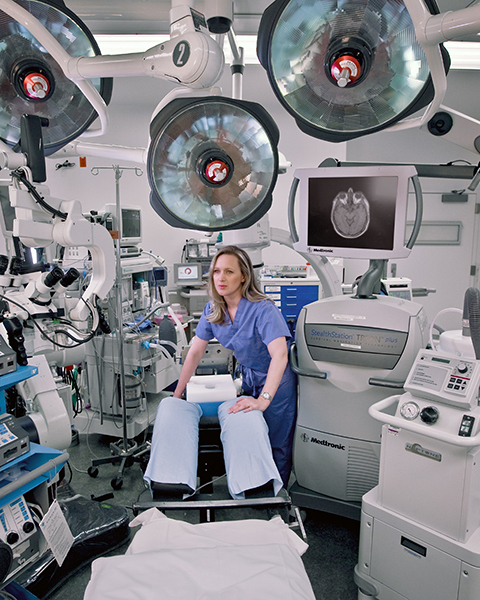 She attended medical school at Case Western Reserve University, and completed her neurosurgery residency at the University of Pittsburgh, one the largest neurosurgery centers in the country, where she was the first woman accepted to the program. Katrina also completed a specialty fellowship in epilepsy surgery at Yale University. Katrina lives in Los Angeles with her husband Andrew, a neurosurgeon-turned-venture capitalist, and their daughter Annika.